One of the most enjoyable parts of planning your wedding may just be shopping for your wedding cake. Whether you are dreaming of a traditional multi-tiered cake with elegant decorations or you prefer something more unusual or contemporary, if you shop around for the right baker you are sure to find a delicious and beautiful creation that will match your vision and your taste. When it comes to selecting a wedding cake, the possibilities are truly endless. The only limitations are really your imagination and your budget constraints. Further, one of the nicest things about selecting your wedding cake is that it allows both you and your fiancé to exercise your ideas to come up with a product that incorporates your blended tastes. For instance, if one of you likes chocolate cake while the other prefers cheese cake and raspberry filling, your baker may be able to incorporate different layers that include all of your favorite flavors. In addition, you can recreate different images or themes of things that matter to you both within the wedding cake’s decorations. And regardless of your preferences, going to the baker for a cake tasting and trying out a wide range of options may just be the very tastiest part of making your wedding arrangements. Wedding cakes come in all shapes and sizes. You may want a wedding cake that looks like a stack of Tiffany jewelry boxes. This is a simple look that is always sophisticated and classy. Or perhaps a cake in the shape of a castle will be the perfect touch for a very royal event. While these are some of the more expected shapes, you can also branch out to capture more unusual effects as well. For instance, a couple who became engaged on a roller coaster might try to find a baker who can create a replica of a roller coaster out of wedding cake. Further, a very artistic baker might be able to capture the silhouette of your wedding gown in an edible form. Or perhaps he or she can make your wedding cake in the shape of entwined wedding bands. If you can think of it, there is likely someone who can help you to turn it into reality in the tastiest way. To get some ideas of wedding cake types and styles, look to some popular bridal magazines, such as Martha Stewart Weddings and Modern Bride Magazine. In addition, Better Homes and Gardens offers some inspirational wedding cake ideas. You can also look to other resources such as The Wedding Cake Decorator’s Bible: A Resource of Mix-and-Match Designs and Embellishments available for under $25 on Amazon.com. While a good baker should be able to provide almost anything your heart desires for your special wedding day, there are some popular cake flavor and icing options that most couples choose from when they order their wedding cake. If you are prefer something more unique, you could also select from the range of non-traditional cake types available, such as mocha spice, key lime and red velvet. These flavors can cost a little more than a white or yellow cake, but can be if you want something different, they money may be well spent. You might also select a pound cake, which is heavier than a sponge cake and also costs more to make. Or consider a carrot cake, which is a popular option that falls on the higher end of the price scale because of the work involved in making it. Even more expensive, though, is a cheese cake. This is one of the most time intensive kinds of cake to make. In addition, if you add fruit, nuts, liquors or other extras to any of these cakes, expect the price to escalate. It is worth also mentioning filling choices, which can impact the total cost of your wedding cake. Some of the basic fillings, including strawberry, raspberry and lemon, are often included in the price of the wedding cake. But if you decide to add a gourmet option, such as mousse, truffle or mascarpone, this can drastically send the price skyrocketing upward. Buttercream frosting is the most common topping choice, and also the most affordable. This is the traditional type of icing that is typically used on birthday cakes. Cream cheese frosting is often used on carrot cakes and costs in the same price range as buttercream. Fondant and marzipan are the most expensive frosting options. These are usually used on very high-end cakes since they can achieve elegant special effects and often make for a very impressive presentation. Often a baker will combine the icing types, using buttercream to frost a cake and then accenting it with fondant or marzipan decorations. 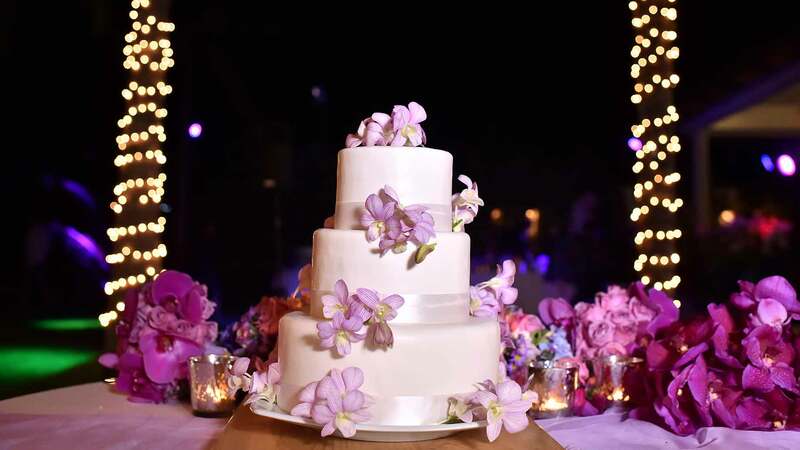 It also worth noting that in addition to the type of wedding cake and icing you select impacting the price, the size you need will also play into the equation, since larger, multi-tiered wedding cakes can take more effort and labor to make. The more ornate the design, the more you can expect to pay. When you start shopping for your wedding cake, it is important to understand that most bakers price their creations by the serving (one serving per guest). The most basic wedding cakes start at about $1.50 a slice. On this very low end of the price scale, you can expect that the baker will provide a small fancy cake for “show” in the reception room, but then provide a very basic sheet cake to actually cut and serve to the guests. In the mid range of the cost spectrum, you might expect a wedding cake with several tiers and simple decorations. This can run you in the $5 price range per guest. The higher end of the price range would be $10 a person or even higher for a fancier wedding cake with fondant icing, gourmet fillings and lots of detailing. The shape of the wedding cake also must be counted into your bottom line. For instance, round wedding cakes can be slightly little less expensive than square cakes or more complicated designs, and the number of tiers will affect the price. Further, keep in mind that a custom wedding cake that you design (either on your own or with the expertise of the baker) could even cost quite a bit more per slice. Delivery charges, if not included in the basic price, can add another $100 or so on to the price (Larger wedding cakes can be much, smaller wedding cakes less, but it also depends on how far it is to your reception site). In addition, some caterers will charge you a cutting fee, which can run about $1 per guest, so this can be an additional expense to plan for in your overall budget. If you are looking for unusual ideas of what you might select to grace your wedding cake table, here are two examples of masterpieces that might inspire you to come up with your own extravagant creation. The first one is a wedding cake that was designed as a replica of the Eiffel Tower. This design was commissioned by a bride and groom in Seattle, Washington and cost $3,500. While this might sound like an extreme price for a wedding cake, the couple had 400 guests to serve, so the price for serving actually came in under $9 each. On a much more extreme level, a wedding cake made of priceless diamonds was recently debuted at a luxury bridal show in Beverly Hills. This wedding cake, which holds the record for most expensive ever, comes in at a shocking $20 million and is a delicate replica of a gauzy wedding dress. The number of servings this wedding cake represents has not reported, since no one would dare to eat such an expensive treat. Further, such a valuable item requires round-the-clock security. And while it certainly won’t be the finishing touch for your own reception, you can use the style as inspiration to design your own such over-the-top creation. Finally, if you don’t have the budget to splurge on even the most toned-down version of an extravagant wedding cake, many wedding planners and couples share a variety of tips on how to cut costs without sacrificing the final results. For instance, if you are working on a very tight budget, you could look to a grocery store bakery to supply your wedding cake. Just make sure that they will make the wedding cake fresh rather than getting it frozen, thawing it and refreezing it again. In addition, a traditional wedding cake topper (or a modern variation) may add the perfect finishing touch. To save money, you can ask a relative or friend to buy this as your wedding gift. Some bakers will also be willing to create an elaborate-looking wedding cake that is built using artificial tiers (usually foam) instead of actual cake, since this can help cut costs a great deal. You can have the look and feel of an impressive creation, but then your baker can use an inexpensive sheet cake to cut the actual slices for guests. This is a very cost-effective way to impress. Offer a variety of desserts so guests can pick and choose what they want. This means you won’t need as large a wedding cake and can therefore keep your costs down. Look to the Wedding Channel for more helpful suggestions on how to make your budget stretch. Some couples also ask someone they know to bake their wedding cake for them as a wedding gift. While this can be a way to significantly cut your costs, just check with your reception site to be sure they will allow a wedding cake to be brought it by someone who doesn’t have a food license. Some states have very strict laws preventing this, so get the facts up front and avoid any unexpected disappointments later. The bottom line is that no matter what you select, with some thought and planning, you can make your wedding cake a lovely and delicious treat that your guests will be sure to enjoy and to remember long after your special day has ended.